CHICAGO (AP) —The Justice Department will investigate patterns of racial disparity in the use of force by Chicago police officers as part of a wide-ranging probe that could lead to calls for sweeping changes at one of the country&apos;s largest police departments, U.S. Attorney General Loretta Lynch announced Monday. The investigation comes nearly two weeks after the release of a video showing a white Chicago police officer shooting a black teenager 16 times and ahead of the expected release of similar footage in another death at the hands of an officer. The investigation, which is separate from an existing federal investigation into last year&apos;s shooting death of 17-year-old Laquan McDonald, also will review how the department disciplines officers and handles misconduct accusations. Justice Department officials say they use such patterns-and-practices investigations to identify systemic failings in troubled police departments and to improve trust between police and the communities they serve. "This mistrust from members of the community makes it more difficult to gain help with investigations, to encourage victims and witnesses of crimes to speak up, and to fulfill the most basic responsibilities of public safety officials," Lynch said. "And when suspicion and hostility is allowed to fester, it can erupt into unrest." The civil rights probe follows recent ones in Baltimore and Ferguson, Missouri, and comes as the police department and Mayor Rahm Emanuel are under intense scrutiny over their handling of the October 2014 death of McDonald. Officer Jason Van Dyke was charged with first-degree murder Nov. 24, more than a year after the killing and just hours before the release of police dashboard camera footage showing the officer shooting the teenager. Emanuel, who initially said a federal civil rights investigation would be "misguided" but later reversed course, said in a news release after Lynch&apos;s announcement that his goal is to create a stronger and better police force "that keeps the community safe while respecting the civil rights of every Chicagoan." The McDonald video shows the teen veering away from officers on a four-lane street when Van Dyke, seconds after exiting his squad car, opens fire from close range. The officer continues shooting after McDonald crumples to the ground and is barely moving. The video does not include sound, which authorities have not explained. The Chicago City Council signed off on a $5 million settlement with McDonald&apos;s family even before the family filed a lawsuit, and city officials fought in court for months to keep the video from being released publicly. The city&apos;s early efforts to suppress its release coincided with Emanuel&apos;s re-election campaign, when the mayor was seeking African-American votes in a tight race. 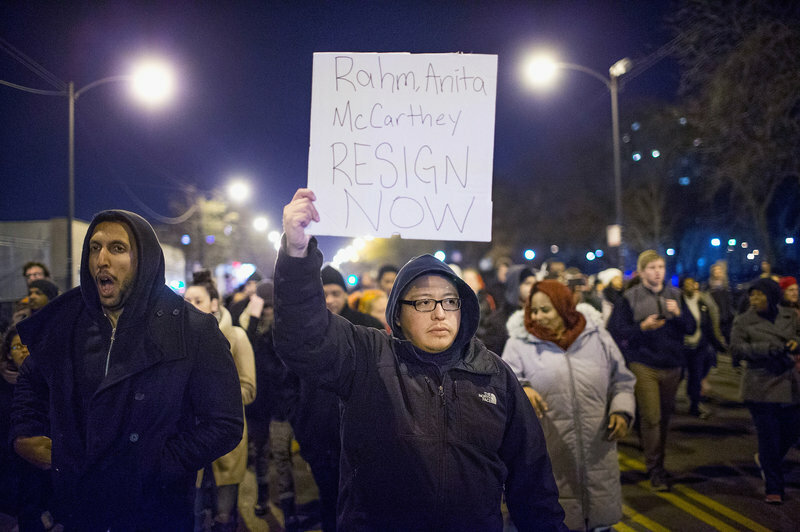 Since the release of the video, Emanuel forced Police Superintendent Garry McCarthy to resign and formed a task force to examine the police department. But the calls for the mayor to resign — something he said he won&apos;t do — have grown louder from protesters, including the voices of more than 200 people during a march Sunday. Protesters counted to 16, in reference to the shots fired. Politicians, including Democratic presidential candidate Hillary Clinton and Illinois Attorney General Lisa Madigan, have called for the federal civil rights investigation. The Rev. Jesse Jackson said he was pleased with the decision and added that he hoped the investigation would focus not only on the police department, but on Emanuel&apos;s office and the Cook County State&apos;s Attorney&apos;s office, which he and others have criticized for taking so long to bring charges against Van Dyke. "All three of them — the police, City Hall and the prosecutor&apos;s office — are suspect," Jackson said. "We cannot trust them." The Justice Department has opened 23 investigations of police departments since the start of the Obama administration. If the Justice Department finds systemic violations, the investigations typically result in court-enforceable agreements between the federal government and the community that serve as blueprints for change and are overseen by an independent monitor. The federal government has the option of suing a police department that is unwilling to make changes. Also Monday, Cook County State&apos;s Attorney Anita Alvarez, criticized for not filing charges earlier in the McDonald case, will speak about the killing of another young black man by city police. Authorities say Ronald Johnson, 25, pointed a gun at police before an officer shot and killed him on Oct. 12, 2014. His mother, Dorothy Holmes, said that wasn&apos;t the case and that her son was running away from police. Emanuel has said the city would release video this week of Johnson&apos;s shooting. Emanuel will also speak Monday afternoon on police accountability with interim Chicago Police Superintendent John Escalante and the new head of the Independent Police Review Authority, a city agency that investigates police cases. The mayor&apos;s office announced late Sunday that the former head of that agency, Scott Ando, had resigned effective immediately. Ando will be replaced by Sharon Fairley, general counsel and first deputy of the city&apos;s Office of the Inspector General and a former assistant U.S. attorney. Chicago police released hundreds of pages Friday in the McDonald case that show police officers reported a very different version of the encounter than the video shows, portraying McDonald as being more menacing than he appears in dashcam footage. That further angered activists and protesters, who were already accusing the city of a cover-up. Emanuel acknowledged "the checkered history of misconduct in the Chicago Police Department" in an opinion column published in the Chicago Sun-Times and Chicago Tribune. "Chicago is facing a defining moment on the issues of crime and policing and the even larger issues of truth and justice," Emanuel wrote. "To meet this moment, we need to conduct a painful but honest reckoning of what went wrong — not just in one instance, but over decades." The University of Chicago said last month that an analysis by its civil rights and police accountability clinic found of 56,000 complaints against Chicago police — but only a fraction led to disciplinary action. Among the most notorious cases, dozens of men, mostly African-American, said they were subjected to torture from a Chicago police squad headed by former commander Jon Burge during the 1970s, &apos;80s and early &apos;90s. Burge was convicted of lying about the torture and served 4½ years in prison.